1. Prepare cake mix as directed on box. Pour batter into 9 x 13 x 2 inch greased baking dish. Set aside. 2. Combine ricotta cheese, sugar, vanilla, and eggs. Blend well. Spread mixture evenly over the top of the cake batter. 3. 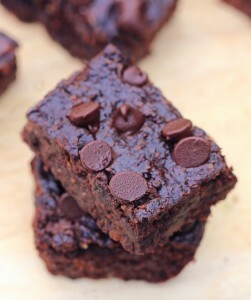 Bake at 350 degrees F (175 degrees C) for 75 minutes if using a glass baking dish, 90 minutes if using a metal pan. 4. Blend pudding mix and milk until thickened. Blend in whipped topping. Puree beans, eggs, vanilla and butter in food processer until smooth. Add sugar, salt, baking powder and cocoa and pulse to combine. Spread in greased 8 x 8 baking pan. Sprinkle with chocolate chips. Bake at 350F for 25-30 minutes. 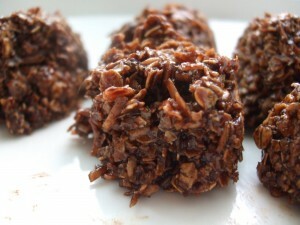 These are awesome and you would never know they’re made with black beans!! Heat oven to 350 º F. I a small bowl mix butter, flour and icing sugar. In another bowl beat remaining ingredients with a mixer on high speed for about 3 minutes or until light and fluffy. Pour over hot cooked crust. Bake for 20 – 25 minutes until almost no mark is left when touched. ( I like to leave it a little softer for a creamier texture). 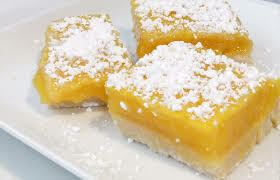 Cool for about an hour and cut and sprinkle icing sugar on top. In a medium bowl combine graham crumbs, 2 tbsp sugar and the melted butter. Press into the bottom of a 9 inch spring form pan. In a food processor combine cream cheese, 1 cup sugar, flour and eggnog; process until smooth. Blend in eggs, rum and nutmeg. Pour mixture onto cooled crust. Reduce heat to 250ºF and bake for 45 minutes, or until center of cake is barely firm to the touch. 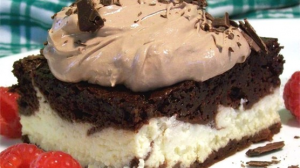 Remove from the oven and immediately loosen cake from rim. Let cake cool completely before removing the rim. 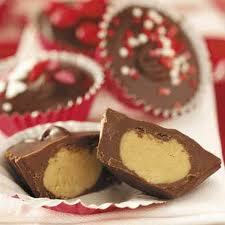 Enjoy these luscious candy featuring a dark chocolate shell and a gooey peanut butter center. 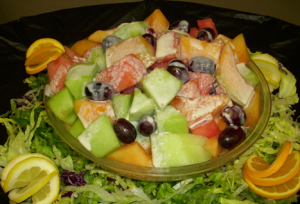 Almost any seasonal FRESH fruit can be used for this recipe! VERY TASTY, VERY REFRESHING! 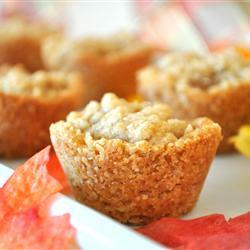 Mini apple crisp cups make a yummy-one bite fall treat, fills your home with the smell of sweet cinnamon apples!